The raw material: Briar pipes are made from the root of the heath tree (Erica Arborea) which grows in the Mediterranean regions - Corsica, Albania, Sardinia, Southern France and Italy, Algeria and Greece. In order to exist in the climate of long, hot summers and cool showery winters, the tree develops large thick roots, which grow deep into the rocky soil, and are very close-grained and hard. The tree grows very slowly, and the best root for pipe making may be 60 to100 years old. Pipe manufacturers purchase the right to remove the shrub growing in specific areas of land from the Government or the Owner. The diggers excavate the roots, cut away cracked and rotten portions, and transport the pieces to the collecting point where they are stacked and covered with earth to keep them moist. The individual digger is paid according to the weight of briar he has collected. From the collecting point the briar is taken to the mill where it is cut into the rough "ebauchons". There is a great deal of briar discarded at this stage as much apparently good wood is found to contain holes and cracks. The ebauchons are graded and boiled in water to kill any remaining life and to remove all tars and resins. They are then stacked in well-ventilated drying sheds for a seasoning period of about 6 months. During this process ebauchons may split and must be discarded. After seasoning the wood is again examined for defects before being put into sacks for shipment to pipe manufacturers all over the world. 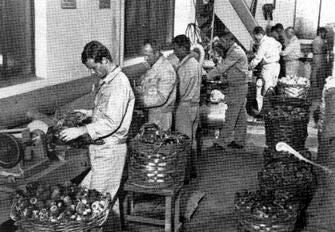 The ebauchons are examined on arrival at the factory and, after regrading, are sorted according to shape, and are cut into suitable sizes for the machines. The first stage is the shaping and boring of the bowl on the Bowl-Turning Machine followed by the cutting of the stem on the Stem-Turning Machine. Care and accuracy are essential for the next process of drilling the stem as the bowl is useless if the bore is not central. These were very labour-intensive processes until the development of a system using a metal template from which several bowls could be turned simultaneously. At this stage the bowls are classified as clean or flawed, and both categories are subdivided into various grades according to the proportions of hard and soft wood, and to the closeness and beauty of the grain. Some of the flaws are deep holes, and bowls with such flaws are discarded. The smaller holes are cleaned and filled with mastic or putty. Out of a bag of 1000 ebauchons, about 30% are used and only 5% or less satisfy the criteria for the best quality pipe. The rough bowls are sandpapered and pumiced with a mixture of fine pumice and oil. This process requires care and skill to ensure that the shape of the bowl is meticulously preserved, and reveals the natural grain for further inspection. The good pipe is completed with a hand-cut mouthpiece which fits exactly into the shank, and the outside is then turned to give a flush finish. The lip is shaped and bored, and the vulcanite is pumiced and polished. 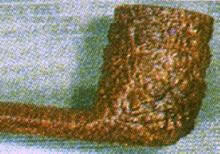 Because of the handwork, two pipes, even of the same shape, are unlikely to have identical inside and outside measurements. With 6mm and 9mm filter pipes, the inside diameter is more consistent. 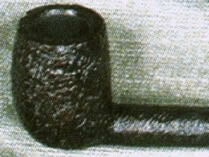 A cheaper pipe would be fitted with a stock, moulded mouthpiece, which only needs trimming to fit the shank. Staining (which is difficult due to the hardness of the wood) accentuates the natural grain, and the use of nourishing oils followed by a drying process gives the pipe a hard permanent polished finish. Matt finished pipes emphasise the grain without having a high gloss finish. Cheaper pipes may be coated with varnish - which may not be lasting and may affect the taste of the smoke. The natural finish pipe is one which has very little staining, and a virgin finish pipe has no staining at all. Usually only top quality pipes are finished in these ways, as any flaws would be immediately visible. However, a lighter finish on a cheaper pipe allows you to see exactly what you are buying. Some pipes are sandblasted - the natural grain is preserved in relief by subjecting the bowl to the effects of heat and high pressure sand-jets. Another confidential process includes soaking the bowls in oil, which causes the soft wood to swell. It can then be carved out leaving the harder wood behind. These processes remove the soft wood from the surface leaving a light, tough bowl. Each manufacturer has his closely guarded secrets which aim at improving the smoking qualities and lasting appearance of his pipes. As many as 30 operations may be required before the top quality pipe is ready for completion. The pipe is then given the final inspection by an expert to ensure that it complies with the desired standard. The smoking qualities of a pipe are determined to a large extent by the curing and drying processes - these must be good enough for the top of the range pipes produced by a given manufacturer. Since the ebauchons are sorted after curing, it follows that a flawed bowl from a manufacturer of good pipes may smoke as well as the top pipe, but it will not have undergone the same finishing processes, and is unlikely to look as good or last as long. On rare occasions, inspection reveals a bowl with grain suitable for a Straight Grain pipe. Straight graining in classic shaped pipes cannot be made, it can only be found, and such bowls are put aside for special attention and finishing. The ultimate, perfect Straight Grain pipe is extremely rare and expensive - we saw one in New York priced at $4500. Straight Grain bowls with minor surface imperfections or irregularities are marked accordingly, and are sold at much reduced prices. Needless to say, the quantities of such pipes are limited. This pattern of tight rosettes or swirls is from the cross-section of the straight grain, and usually appears on both sides of the bowl, with the horizontal straight grain showing across the rim of the bowl. The plateau is a different cut from the ebauchon - it is a wedge shaped piece cut from a slice across the briar, sufficiently thick to yield a fair-sized bowl. This more expensive cut is usually used for "Freeform" pipes, as the flat surface can be moistened showing the grain and a bowl shape can then be sketched making the best use of the grain. The bowls are shaped according to the grain of specially selected ebauchons or plateaux and are usually extremely comfortable in both the hand and the mouth. Being a little larger as a general rule, the extra thick wood keeps the bowls cool to the touch and makes them ideal for relaxed smoking. Because of the amount of handwork involved, only top quality ebauchons are used, and the finished pipes are works of art, appreciated by Connoisseurs. See "Freeform"- pipes with personality.